People ask me if trees are taller in New Orleans. Sitting here, in Connecticut, on Church Street, on this nape of grass at the back of the park, I scan for sugar maple. The trees in New Orleans don’t spread up. They spread out. They widen themselves like octopi, like spiders, like some uncoiling thing, wild and uncontained. New Haven trees shoot up. They are tapered, like extended patience. They attenuate for a sun that will soon elude their reaching thatch for other seasons. New Orleans trees, New Haven trees; in both places, in all their stretching, they seem to be static, standing still. Appearances are deceiving. Wherever they are found in their stillness, trees are stretching out all the time. Trees are in a constant dance with the sky, and I am merely a person with a pen, a stenographer encoding small scraps of paper; I am trying to keep up with the trees. They speak at a speed I have a hard time understanding in a very old vernacular, vernacular far older than my short years of study. Their insides are loaded with revolutions, circles that reflect the years they’ve been living. My feet brush where the sky begins, and it begins underneath me, the same place it begins for the trees. Like the scraps of paper I scrawl on, the sky is in a constant state of revision. It starts at earth-level, and then goes up roughly seven miles or so. This beginning is called troposphere. I am sitting and standing in it. And, spreading out, or spreading up, so are the trees. The sky is not some elusive thing. We are touching it. The sky is here to be moved in every day. No one knows that better than the trees. Most of my time lately is taken up with traveling. Tonight, I am surrounded by sky, covered by storm. In New Orleans, nothing stops them. This is not hurricane, just a typical squall. Summer is full of them. Magazine Street has become a river that strews cars everywhere. Rescue vehicles rush by as we ford our way. Corner after corner, windows are dark. Driving down some side streets proves to be a total mistake. We keep backtracking, trying a new route, “turtling” along. A suburban coming up from behind misses the glint of our back-up lights indicating our slow retreat, almost collides, flips us off for not being fast, flips us off before charging forward. I hope they make it. Twenty-five feet ahead, this road drops off three feet to become water; appearance deceives and change is every storm’s nature. Like rushing water, thoughts are quicksilver. The difference between hesitation and contemplation can be a fine line. One is stuck, the other in motion. That fine line itself can cause a collision. Changing views from current to future, the sky’s speed can create an uneven landscape, fast and slow coming in contact, followed by crash. Changing the current, from one’s present, to someone else’s, can create turbulence. I sit back under the trees and wonder how many times hesitation has held up choosing, and, the weather of that holding pattern of thoughts. The choice of greater reflection, the yondering wide of “ponder,” like water drops shifting ponds, thoughts’ invisible meanderings are named “reflections,” too. Thoughts drive dreams, and dreams, like thoughts, are just another kind of branching. Thoughts and dreams are designed to unfurl, like trees and roads and rivers. Dreams start small then they ripple. Dreams build from tiny tissues of nerves carrying images of what already has been, images of what might come, and images of what’s happening; from a splash into a fine river of reflection. Dreams, all their assembled roots add up; they spread with each contemplation. Dreams can be turbulent tracks of changing reality. Cultivated or wild, dreams can meander, although wild meanders more, like weeds; like New Orleans trees. I want my dreams to be like weeds—a multitude of wild things continually cultivating themselves. “ I am merely the place where things are thought or felt,” Countless Lives Inhabit Us, 13 November 1935, Fernando Pessoa & Co. Whether tree, water drop, turtle, human, or dream, maybe being alive carries a code, and that code speaks a constant of design—start small and reach yourself out. The Mississippi, I am told, starts out as a splash. Over miles, it gathers, deepens and spreads. Its currents collect, until, eventually, everything collides with the Gulf of Mexico. Water drops that make the Mississippi start infinitesimal. Felt when it’s humid, yet, they pass often for invisible things. Carried by air currents, they gather around dust. Slowly, they extend; themselves to other drops. As they ascend altitudes, they gain names like cirrus or stratus or cumulus. Eventually, those singular drops of water find their way to something larger than themselves, first sky, then storms, then splash, then river, where they start the spreading all over again. Trees start small too and erupt into something wider. So do we; a small ball of cells stretching and ascending to something that widens into air. Transition can be tedious. It can also be a miracle of new definition. It is up to imagination to decide which way the view is from. I move again, walk and sit. The difference between obliteration and other is the ability to try on change, to maintain the lines of contemplation, to shift currents without too much turbulence. A confessionist, all these little paper scraps, like drops of water, only reflect what I see. These scraps trail the meandering of currents. We leave pieces behind all the time, trails of ourselves that become something else. The sky reflects these trails, an “etch-a-sketch,” then fills back up with white-empty. Not only is water sky filling, our breath is, and our bodies are too, tiny little flecks of cells heading to scrawl across blue, flecks spread far from earth-found feet. We hardly ever contemplate pieces, or how much of self we spread away while still alive, spread things that ride the air. Shedding is part of spreading out. Each shed piece speaks out separate, until collected again as singular “other.” Re-gathered with others, collected dust gives water a singularity of moment, something to grab on to. Clouds don’t care where you come from, so long as you come. Clouds return as the collection of smaller things; the spreading away a circle, the pattern like the insides of a tree, the pattern like the circles in a puddle. Thoughts, as they spread, are re-framed too—“contemplation” to “collection.” Life can be like a tree, a spread thing. Life can be like an arrangement of glass, spun for thoughts to appear in. Transparency leaves appearance open, no room for deception. Then, whether the glass is open, or closed, thoughts can still arrange, loose as live octopus. Transparent, life can cultivate, and we can still see beyond extending spread, see beyond our own bias. Maybe thoughts are meant to be a derivative of glass; look along them, and let our reflections reach us out onto the other side. Karel Sloane-Boekbinder recently had work published in Blood Lotus and Noo Journal. Her artistic disciplines include theater, writing, film/video and visual art. She is one of Maybelline New York’s Inspiring Confidence Through Education Contest for PEOPLE Magazine winners, 2006, for her work in arts administration. 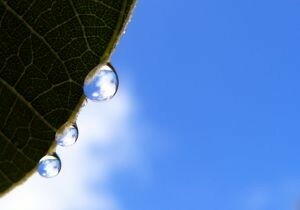 Photo "Reflections: Sky and clouds reflected in raindrops on a leaf" courtesy of Dez Pain, Brisbane, Australia.